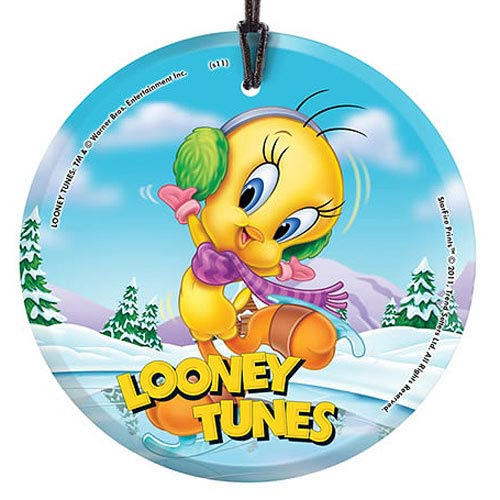 Tweety is featured on this stunning glass tree and window ornament. Complete with a hanging string, this Looney Tunes Tweety Skating StarFire Prints Hanging Glass Print comes ready to display! Measures 3 1/2-inches in diameter. Since the release of its first cartoon in 1930, Warner Bros. Animation's family of now-classic Looney Tunes animated characters have evolved into a beloved part of our culture and emerged as true entertainment legends enjoyed worldwide by both children and adults. Setting the standard for irreverent, satirical humor and inventive, quality animation, the studio created such venerable stars as the indomitable Bugs Bunny, the explosive Daffy Duck, the tender-hearted Porky Pig, and their cartoon cohorts Tasmanian Devil, Sylvester and Tweety.